The purpose of this Rule is not to place any limits on users’ ability to print single sided. It is only to educate them on the benefits of printing double sided. It will give them the option to cancel their job and re-print it double sided, after showing them a message regarding the savings. This Rule assumes that all users have the PDAgent installed on their workstations. This is required in order for the popup window to be displayed. In the Rule name text box, under the General tab, enter Double sided printing advice (or any descriptive name you like). Change the Action on rule violation to Message only, continue job (only applies to printing). 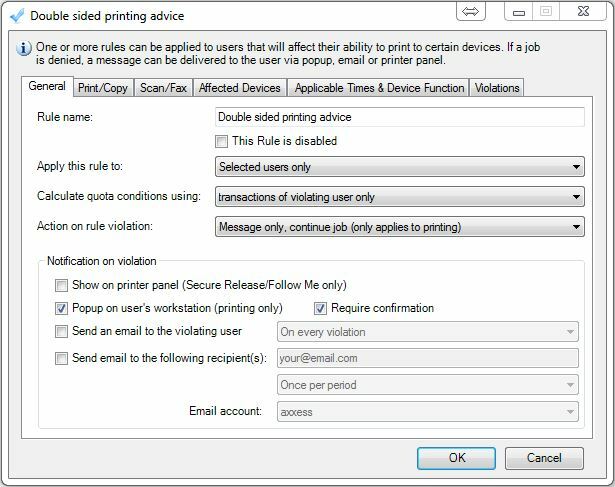 In the Notification on violation frame, tick the Popup on user’s workstation (printing only) checkbox (so the user gets an immediate popup on their workstation). Adjacent to this, tick the box Require confirmation which will enable the user to cancel the job and reprint. 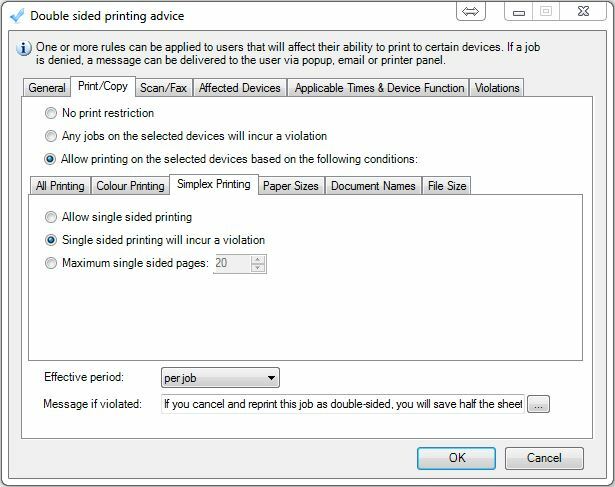 Click the Simplex Printing tab, select the Single sided printing will incur a violation option. Change the Effective period drop down to per job. Change the Message if violated text to If you cancel and reprint this job as double-sided, you will save half the sheets of paper (put in whatever message you want the user to see). This is only necessary if you chose Selected users only from the Apply this rule to drop down. Otherwise the Rule will be applied to all users anyway.